The Rotary Wheels for Learning (RWFL) Program is an international humanitarian project which is led by the Rotary Club of Gravenhurst, Ontario. Originally started up by Lisa McCoy, it was handed over to Mike Cole and MaryAnne Marshall in 2016. 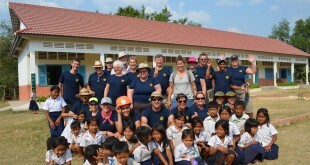 In its eighth year, the project’s original mandate was to provide bicycles to impoverished rural children of Cambodia so they may have the opportunity to attend school. Thanks to the financial support from District 7010 clubs such as Englehart, Minden, Bracebridge, North Bay, Huntsville, the Barrie Clubs and Collingwood, we have managed to distribute 7300 bicycles to date! However, as MaryAnne and I developed relationships with the various Non-Governmental Organizations (NGOs) working in Cambodia, we have come to realize that getting the children to school is only half the problem…..keeping them there is an even greater challenge. We have learned that 40% of all rural schools in Cambodia do not have access to clean drinking water, while 63% do not have proper latrines. So while we can get the children to school through the provision of a bicycle, we cannot keep them there as many of them become ill through dehydration or disease caused by improper sanitary conditions. What’s even more concerning is the dropout rate of girls. As soon as girls begin puberty, they often stop going to school all together as they simply do not have the facilities to maintain their hygiene. Imagine having to quit school because you don’t have access to a proper latrine and wash area. To begin to address this problem, we have evolved the RWFL Program. Bicycles will continue to be the team’s focus on the ground, but we will include several service projects each year that will see us fund the building of wells, wash areas, latrines, and even playgrounds – playgrounds actually attract and keep the younger children going to school. Dates: Late January – mid February each year. Team size: 18-20 members (Rotarians and Friends). RSVP: Interested members should send a response by mid-July to secure a place on the team. Previous Welcome to the 2019 Executive! Next 37th Rotary TV Auction -Please click the link for details!